A couple of days ago, I found my lost iPod in my drawer. That is an iPod nano, and it has thousands of songs inside. It still works, but I have got a new iPod touch to replace this iPod nano. So I want to transfer the songs from the iPod nano to iPod touch 5. Any good suggestions? Many iPod users may come up with the similar problems. When a new iPod is released, some iPod users choose to update their old iPods to the new iPods. But the songs remain in the old ones. So users will have to transfer music from old iPod to new iPod if they want to enjoy music in the new iPod. Plug the Old iPod into computer via the USB cable. Then launch iTunes. Click “File > Device > Transfer Purchases”. 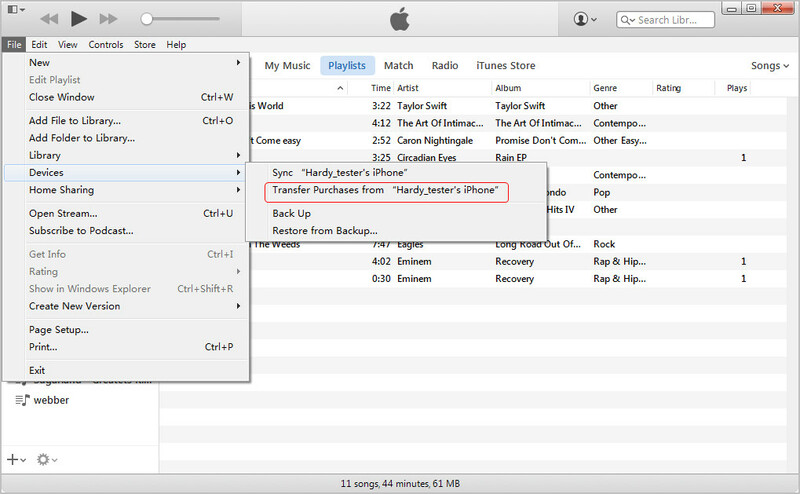 iTunes will automatically transfer the songs to iTunes library. Plug the new iPod into computer. Then import the songs from iTunes to the new iPod. Run Leawo iTransfer after installing it on your PC. Then connect your iPods to computer with the USB cables. The software will automatically detect your devices and show the libraries of each iPod in the left sidebar. Click “Music” of the old iPod, and then the songs will be shown in the right part of the software. 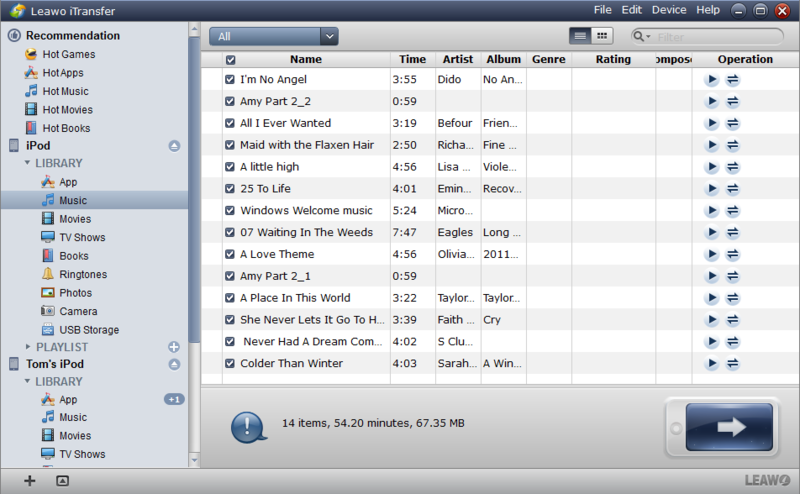 Click the transfer button (right arrow in a dark blue square) at the right bottom to transfer all the music files. Or you are allowed to hold “Ctrl” and click to choose songs, and then right click the chosen songs to “Transfer to > My New iPod”. 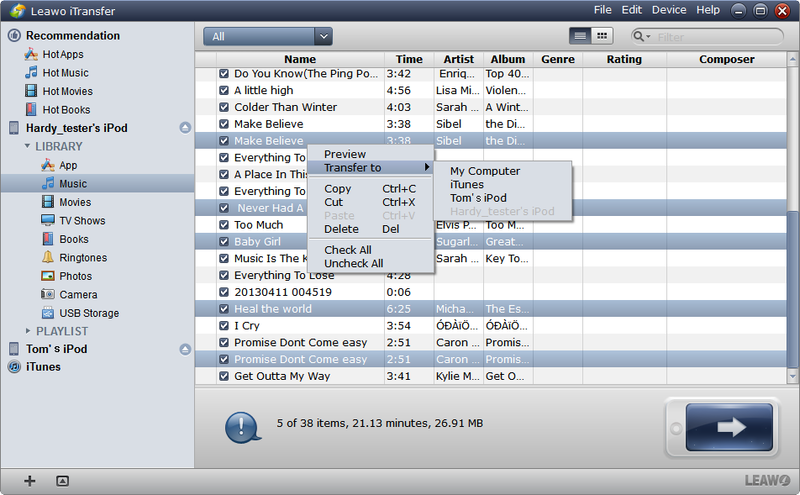 The dialog of transfer settings comes out after clicking the transfer button or right-clicking to choose songs. 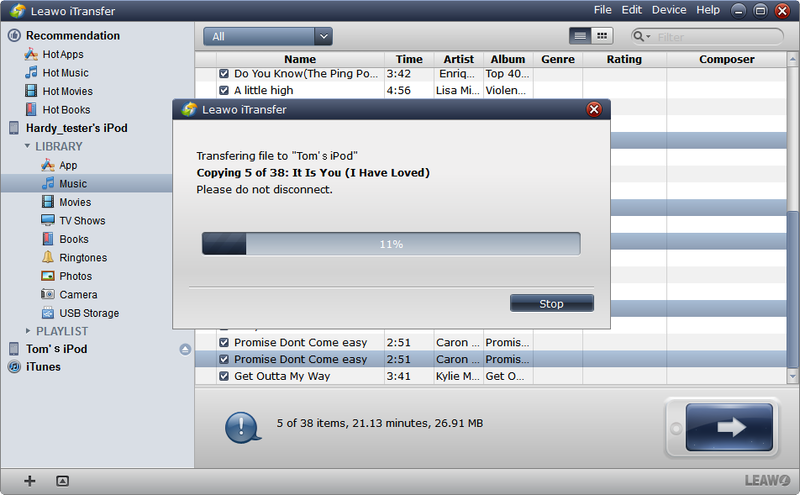 Check the “Transfer to List: My New iPod” and then click “Transfer Now” to start the music transfer. When the transfer begins, a dialog of transfer process will show up. The progress bar in the dialog will notice you the percentage of the music transfer. You will get all the songs in your new iPod when the transfer finishes. 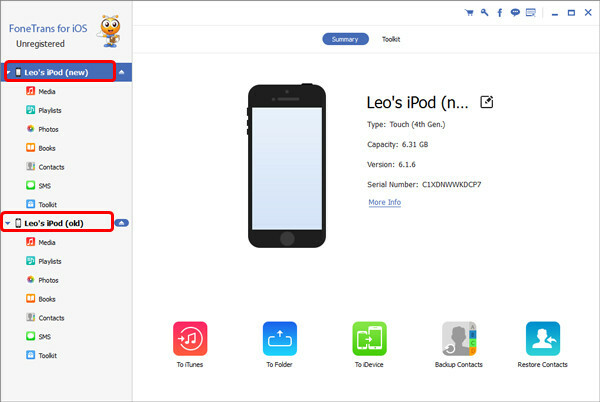 Leawo iTransfer makes the data transfers among iOS devices, iTunes and PCs easy. And it provides much convenience for the file transfers in our daily lives, so check it out. You can also take advantage of another powerful and helpful iPod transfer program to transfer music from iPod to iPod: FoneTrans for iOS. It enables you to transfer music directly from one iPod to another directly. 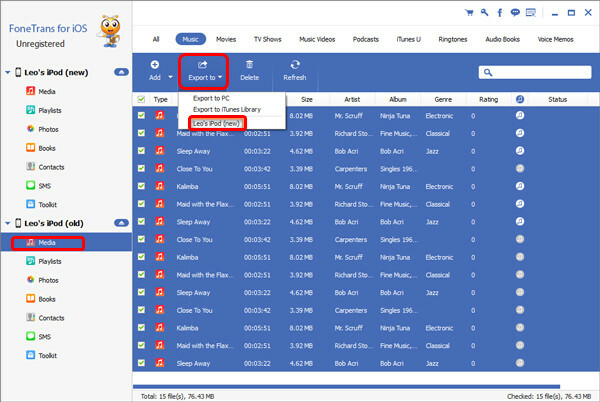 If you have tons of music stored in your old iPod and you are finding a easy way to transfer them directly to your new iPod, the third-party software can help you finish the task in few minutes. 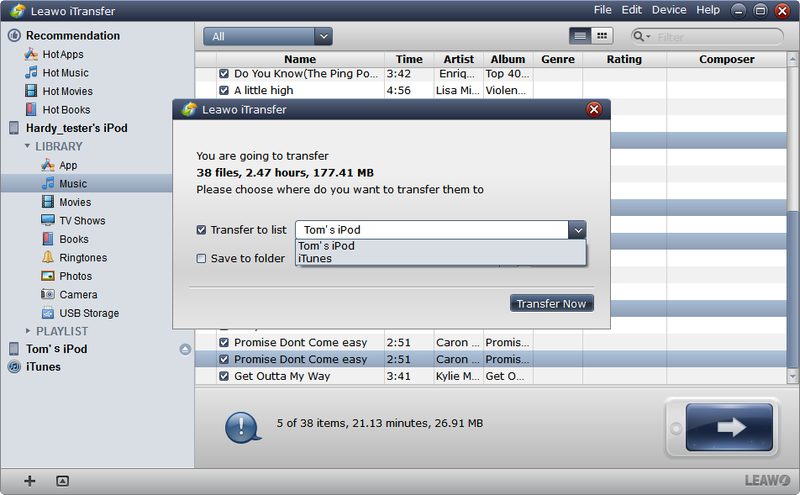 Follow the steps below to know how to transfer music from iPod to iPod with FoneTrans for iOS. Download and install the FoneTrans for iOS and run it on your computer. Use USB cables to connect both iPods to computer. So you can transfer music from iPod to iPod directly. Wait moments for the software to recognize the devices. On the left sidebar of the window, go to iPod which stores the music and find the “Music” section. You would see all the music displayed on the right side. Highlight the songs to transfer from iPod to iPod on your computer. If you are going to select all songs, just tick the box on the top of music list. Find “Export to” button on the top navigation menu. Press the small triangle icon next to it. Then it appears a list, choose “Export to iPod” . Press OK to confirm selection to transfer songs from iPod to iPod.